Today's oddball set ranks as one of the most bizarre marketing creations since "snails as food." 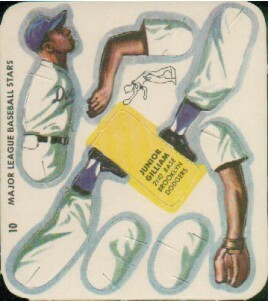 Available only by mail from Swift Meats, the collection of 18 punch-out cards came in an envelope with a baseball game board. Once opened and splayed onto the table, they must've looked disturbingly like a pile of butchered baseball players. Kind of like Re-Animator, you'd breathe new life into them by popping each piece out of the frame and following the tabbed instructions. In the end, you get a 3-D version of a 2-D tradition. I think it's very weird, and it would completely creep me out if the figures smelled at all like lunch meat. Building both 9-man teams no doubt took some time, but Swift's tasty plan didn't stop at skeletal reconstruction. Plant your zombie baseball army atop its diamond-shaped game board and follow the instructions for a lite version of the spinner-based, Cadaco All Star Baseball experience. Unfortunately, there's no indication any single player performed better than another. Cadaco paid careful attention to each player's career performance and rendered it differently than all the others. This gave you a reason to pick different lineups and personalized the game. Swift's generic treatment of both it and the player pictures don't compare favorably. But hey, packaged meat products! Credit Marty's PSA Graded Cards for the flattened picture of #10 Junior Gilliam and see a 2006 Robert Edwards auction for pictures of the unpunched set, envelope, and "field." 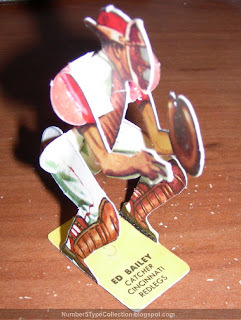 My only example's the looming figure of #5, Ed Bailey, complete with hand-written digit above his name. Discarding the paper frame meant losing track of the checklist order, a curious design choice with all that extra space next to the player name and position. I'm sure it made sense at the time, when you're already dealing with the chopped-up bits of Frank Robinson. Oh, the humanity. They came in the packs of dogs - I know I had some and they always got a little moist. I am nearly positive because I never sent away for them and had them.